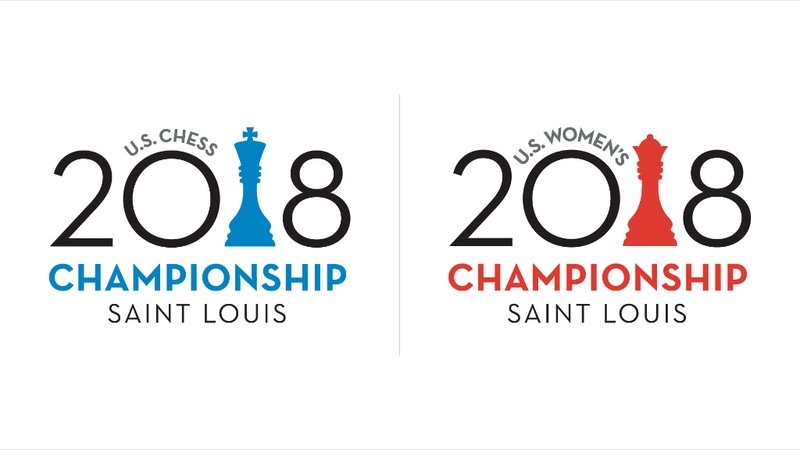 The first day of the 2018 U.S. & U.S. Women’s Chess Championships kicked off with a plethora of exciting matchups that were surely going to bring the fire to the board, the commentary booth, and to all the fans across the world that chose to tune in. And it did not disappoint! 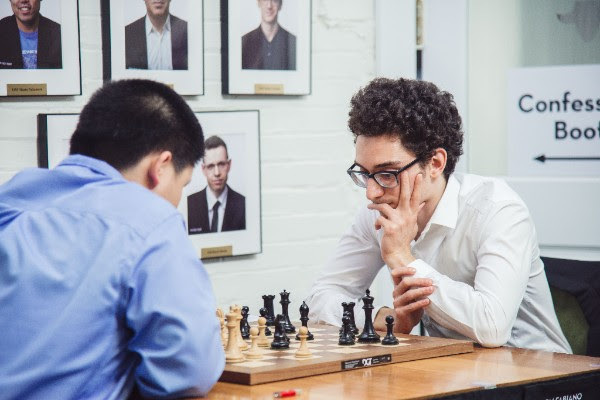 In the open section the big clash of the round was the battle between the young prodigy, Awonder Liang, and the man of the hour, Fabiano Caruana. The world championship challenger chose to surprise his opponent as early as move one, when he chose not to employ his pet line, the Petroff. Instead, we got an unbalanced Sicilian as an early treat; nevertheless, Awonder chose the tame 3.Bb5 and forcefully stirred the game into more calm waters. 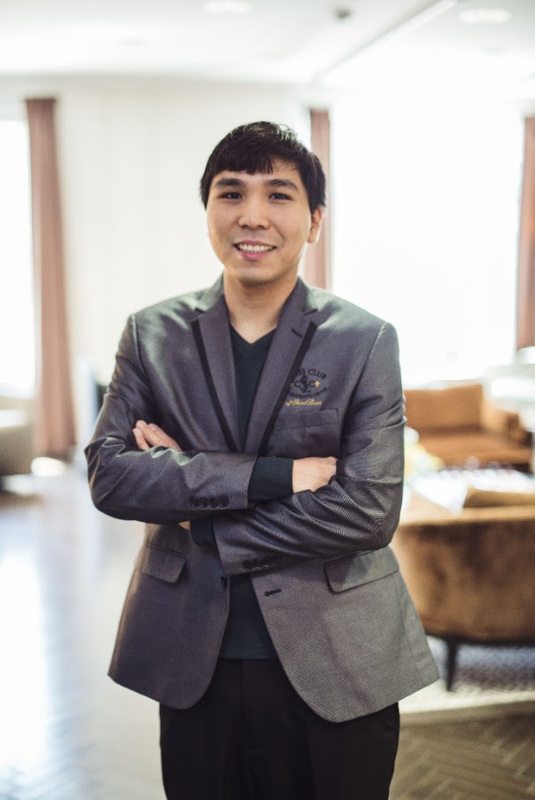 His decision proved to be very practical, as he managed to neutralize Caruana’s attempts to destabilize the position. The game was drawn without many complications arising along the way. The always fierce Nakamura chose a wild line of the Scotch gambit to try and rattle the precise Robson. Unfortunately for him, it all backfired after Robson accurately neutralized his attempt and even obtained a better position out of the opening. Nakamura sensed the looming danger and decided to simplify the position as quickly as possible before things could have turned dark for him. The game ended in a draw soon after the 30th move without many fireworks exploding on the board. Wesley simply just proved his overwhelming class in this one. Zherebukh got a normal position after the opening, but in the ensuing maneuvering middlegame, So outplayed his opponent with ease. With each move, So’s pieces were improving, while his opponents were losing their position and poise. Zherebukh’s 26th move, Kh1, was a complete blunder as he allowed the tactical blow 26…Nc2! Which secured a utterly winning endgame for black and Wesley had no problems converting. Strong start for the defending champion! Jeffery has had a pretty difficult 2017, but his first tournament of the year was quite a successful affair (winning the GM Invitational in Saint Louis). Coming off with a great attitude, and facing the newcomer Izoria, he was surely the favorite going into today’s round. His offbeat approach allowed him to slowly outpace his opponent, and by the 30th move he was already a clean pawn up. Unfortunately for him, his technique failed him in the endgame and allowed the Californian to save half a point after a tenacious defensive effort. Izoria will surely be happy with his inaugural game in the U.S. Championship, Jeffery will surely look to bounce back from his disappointment and pick back the pace in the upcoming rounds. Quite an interesting game ensued between these two fighting ladies. Goletiani skillfully stirred the game into an unbalanced reversed color Benoni, and obtained a nice advantage early on. Zatonskih fought back and slowly but surely managed to outplay her lower rated opponent. 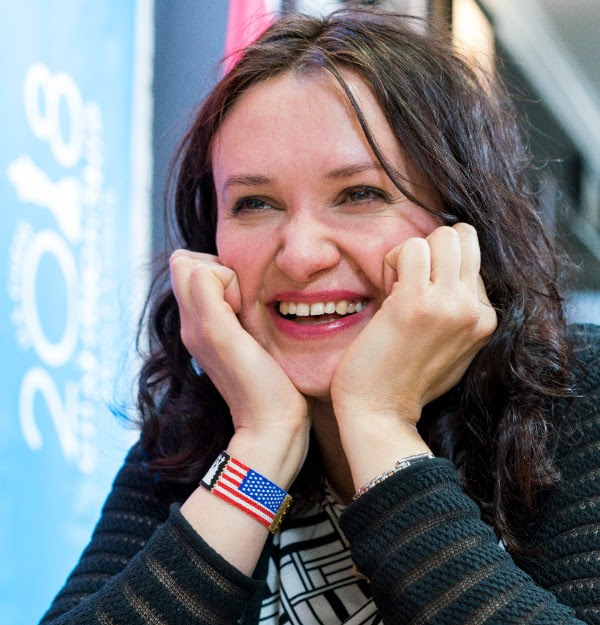 The 4 time U.S. Women’s Champion, Zatonskih, failed to find the killing blow (25…Bf6!!) which would have secured a decisive advantage after the ensuing complications. After that miss, Goletiani was able to get back into the game and successfully managed to save half a point. A scintillating battle between the U.S. Girls' Junior champion, Akshita Gorti, and her much more experienced opponent, 7 time U.S. Women’s Champion Irina Krush. The young Gorti played a balanced game up until the 34th move when she blundered with Nd2, allowing for a beautiful tactic that should have ended the game for Krush. Fortunately for Gorti, Krush’s technique completely failed her as she allowed the young champion back into the game. In the end, it was Gorti’s tenacious defense that saved her from the claws of her experienced opponent. A great save for Gorti, and a disappointing miss for Krush. This was a wild affair between two of the favorites of the event. 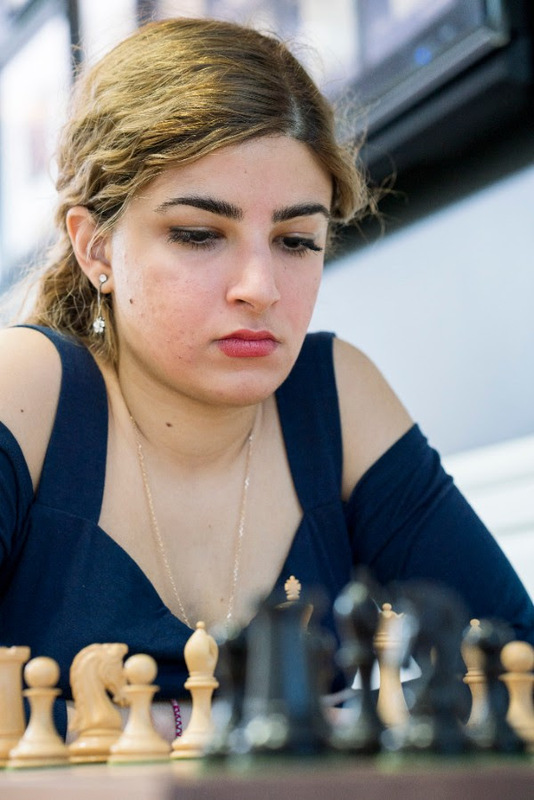 The reigning champion surprised Abrahamyan early on by choosing the Caro-Kann, an opening that has not been part of her usual repertoire in recent years. Abrahamyan chose an aggressive line, and Foisor’s inexperience showed early on, as she allowed white to get a powerful center coupled with a menacing space advantage. Foisor cleverly offered her opponent a poisoned pawn, which when accepted, opened a new wave of opportunities due to her active placed pieces and the control over the light squares. Despite her extra material, Abrahamyan did not manage to find a way to neutralize her opponent’s compensation, and in the end she had to allow Foisor’s perpetual check. A complex draw that allows both contenders to remain fairly satisfied after the first-round melee. Quite an interesting battle between the two young contenders. Wang sacrificed a pawn for compensation early on, and slowly managed to construct a powerful initiative around her superior piece play. Feng was doing fine all the way until the endgame, but unfortunately for her, the rook endgame was simply too complex for her, as she allowed her opponents rooks to penetrate the 7th rank and create menacing threats against her king. The difference in piece activity proved to be decisive, as Wang scored an important win which propulses her to the top of the crosstable. 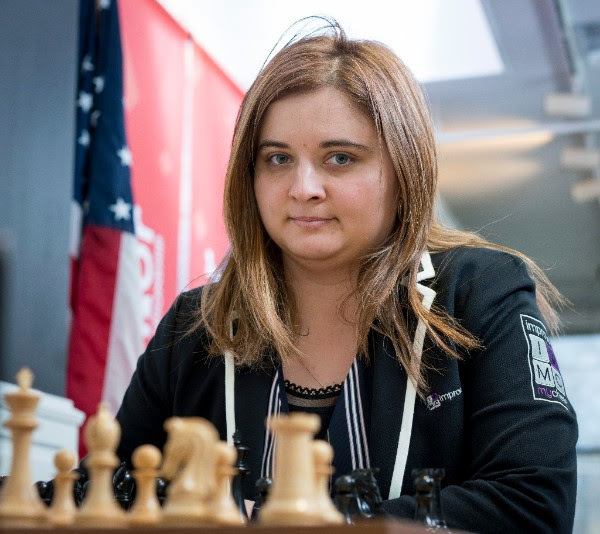 Derakhshani started her U.S. Championship quest with a powerfully prepared opening, allowing her to get an advantage as soon as move seven, after her opponent’s sacrificed surely backfired. Once again though, as it has happened in many games during this round, the player with extra material failed to prove their technique and allowed their opponents back into their game. After Sharevich managed to get her pawn back, the draw was easy to achieve. A combative way to start the US Championships for both sections, the upcoming rounds are going to be very interesting to watch!